These little sputnik-shaped vegetables come in green or purple, can be eaten raw or cooked, and taste a lot like broccoli stems. 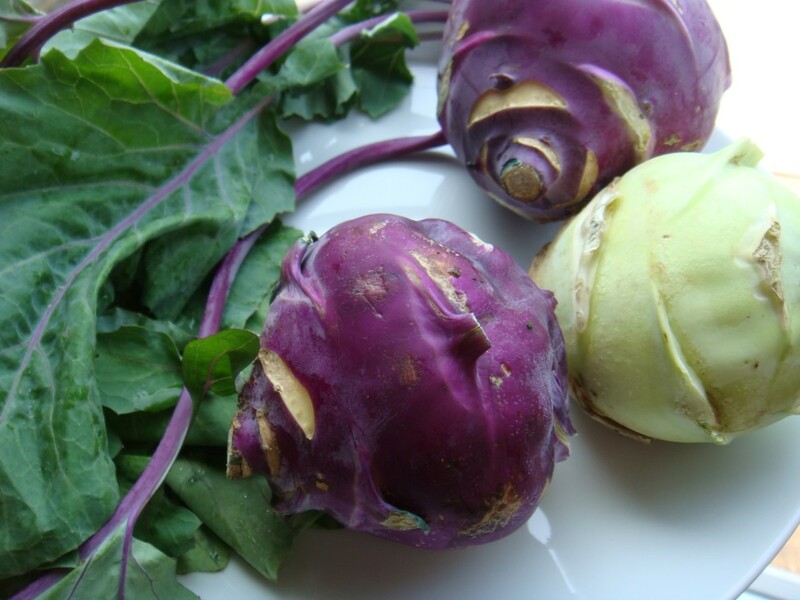 The word kohlrabi is German for cabbage turnip (kohl as in cole-slaw, and rübe for turnip) though kohlrabi is more related to cabbage and cauliflower than to root vegetables. We usually eat them raw, just peeled, sliced and added to a salad, but they are also delicious cooked and are often used in Indian cuisine. If you click on the link above, they also provide you with several recipes, using both cooked and raw kohlrabi. 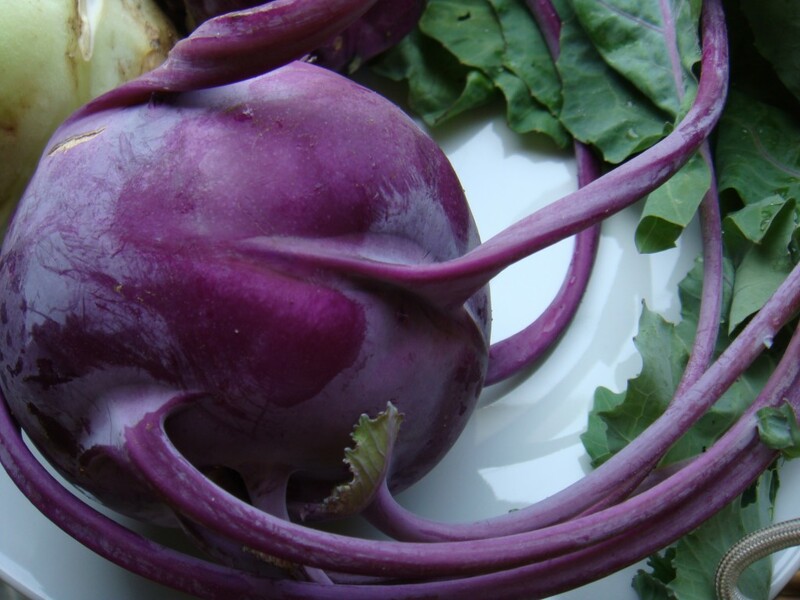 Prior to last week’s CSA share (from Red Fire Farm), I had never eaten kohlrabi. I knew what it was… sort of. Had no idea what it tasted like or what to do with it. I must admit that I absolutely LOVE the purple color though, so when given the choice between the green or the purple this week, of course I reached for the purple. It appeared that I wasn’t the only one. I arrived to the CSA pick-up location late. 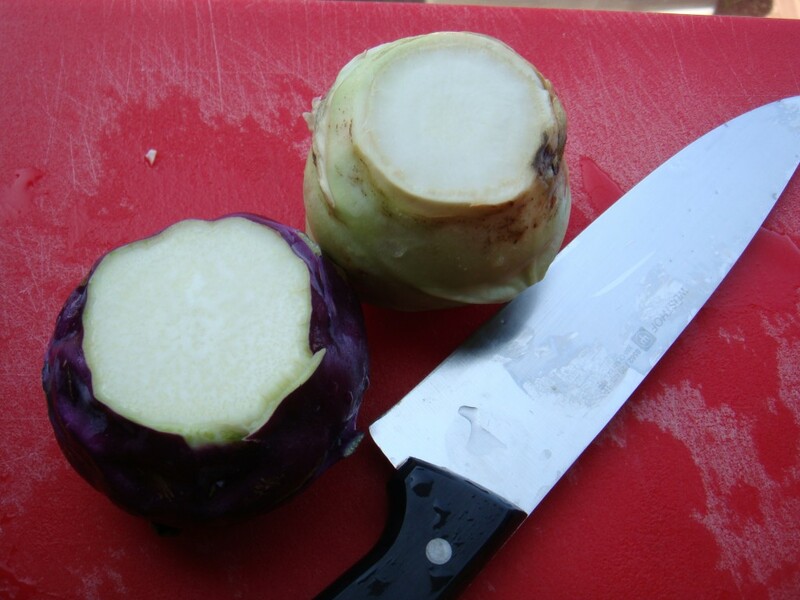 There seemed to be a LARGE amount of green kohlrabi left… but only a few heads of purple. Was this just a color choice… or was there something behind this favoritism? I decided to do a raw taste test… with the boy (who is still 5). First thing I noticed is that on the inside, they look exactly the same — pale in color. They are a bit firmer than I anticipated… almost like jicama. They smell like a cross between a raw potato and a radish. I felt that the purple one had a SLIGHTLY more radishy smell. I cut a slice off each, split it in half and the 5-yo and I dug in. We ate the purple first (of course!). It was very crunchy, fibrous and tasted exactly like it smelled, like a cross between a raw potato and a radish — with a little bit of bite to it (like a spicy radish). Next up, the green. VERY similar… but more mild, with not as much bite to it. I left one purple untouched. I’m going to cook it. I’m thinking about making a puree, maybe adding a little horseradish and serving pan-fried trout over it… in a picatta-like sauce. I think that would pair very well. So, what else did we get in our week 3 share? We are going to friend’s for dinner tomorrow, so I will bring a big salad. I’ll use the leaf lettuce, raw kohlrabi, raw turnips, onions, cilantro and maybe some of the chard. I’ll probably throw in some tomatoes and cucumbers, crumbled goat cheese, walnuts, dried cranberries and dress it in a simple balsamic vinaigrette. Yum!